Since Tiny Brains is launching alongside the PS4 for that console first, it made sense to show off the game on the PS4. This was my first time trying out the new console, and I have to say I felt right at home with the controller. A fellow media reporter and I were shown through a few different parts of the game, giving us an extensive and thorough look. Between devs and reporters, we had a full group of 4, allowing us each to control one of the four available characters in the game. Each character has a special ability, either Create, Vortex, Teleport, or Force. Create materializes an ice block in front of the character (which he can detonate), Vortex pulls an object towards the character, Teleport swaps the places of the user and the targeted object, and Force pushes an object away from the character. In our play session, I was the green rabbit with the Vortex ability. I asked how the game would be played with less than four people and was told that in those cases players would be able to swap to the other characters immediately (being able to swap instantly was hugely important to the devs) in order the solve the puzzles in real-time. We played through two stages of the story campaign (the game will be launching with four chapters). Throughout the stages our team was presented with multiple kinds of puzzles we were tasked with cooperatively solving. Sometimes we had to figure out how to get a battery across the room and plugged into the wall. This often involved some kind of creating an ice block, forcing that ice block with some other characters atop of it across a void, and swapping or vortexing the battery into different positions. Sometimes we had to guide a giant red ball up or across tricky areas, full of places it could drop or fall. If we lost the ball, we had to start from the beginning (or a checkpoint, in the case of especially long areas). Other times our characters had to protect a pink chick (not “chick” as in woman, but literally a baby chicken) from evil regular chicks. While we could jump on the evil chicks’ heads to kill them Mario-style, we could also use our powers to force them into traps, or vortex/force created ice blocks onto them to squash them. I found the story campaign to be lightly challenging and fun. It would definitely be great as a party game where non-gamers or light gamers could equally join in. The controls are simple (movement with the left analog, the square button for the character’s power, and optionally power targeting with the right analog), and the game is utterly cooperative. There are multiple ways to solve the puzzles as well, and it was certainly gratifying to surprise the developer with new ways we solved the puzzles. In addition to the story campaign, Tiny Brains also has four other modes: Tiny Challenges, Tiny Soccer, Tiny Trolls, and Jules Mode. We got to also play Tiny Challenges and Tiny Soccer. 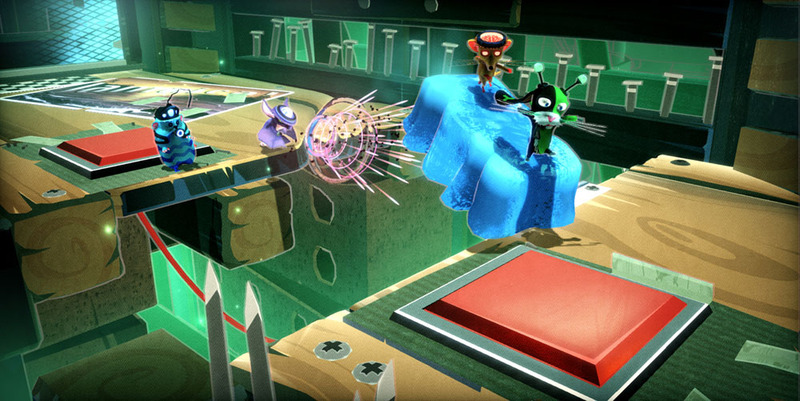 Tiny Challenges replicates the same kind of challenges seen in the story mode, but with a score factor. We played a couple of the Ball Challenges where we had to get the red ball as far as possible. Our distance with tracked in centimeters, and as we kept going, it kept getting more and more difficult with more gaps that the ball could fall through. 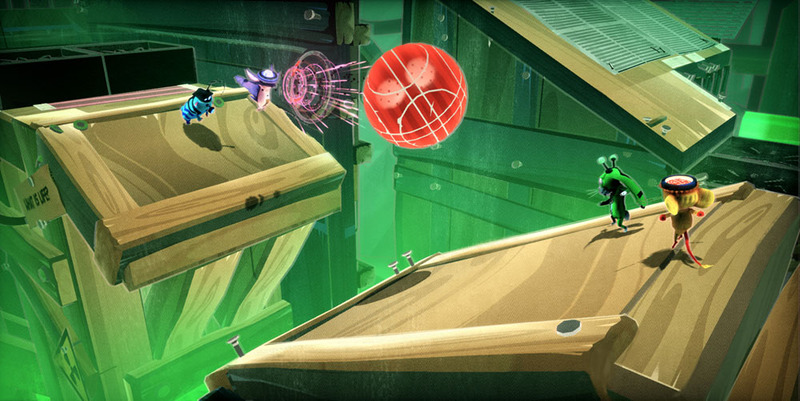 The Ball Challenges are procedurally generated, so they’re infinite. 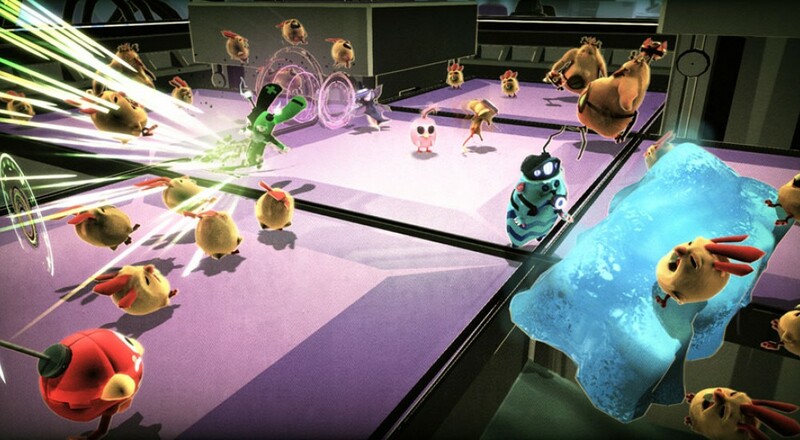 Other challenges include Combat Challenges (where players have to protect the pink chick as long as possible from the evil chicks) and Puzzle Challenges (where players are tasked with solving a puzzle as quickly as possible). Tiny Challenges will come complete with leaderboards, so players will be able to do the challenges over and over to try to beat their friends’ (or top players’) high scores. I was told that about half of the challenges will come unlocked without completing any of the story mode, while the remaining challenges will unlock as players progress through story mode and acquire collectibles. Tiny Soccer was the last mode we got to see. It was a player-vs.-player (PVP) mode, and was actually quite fun. 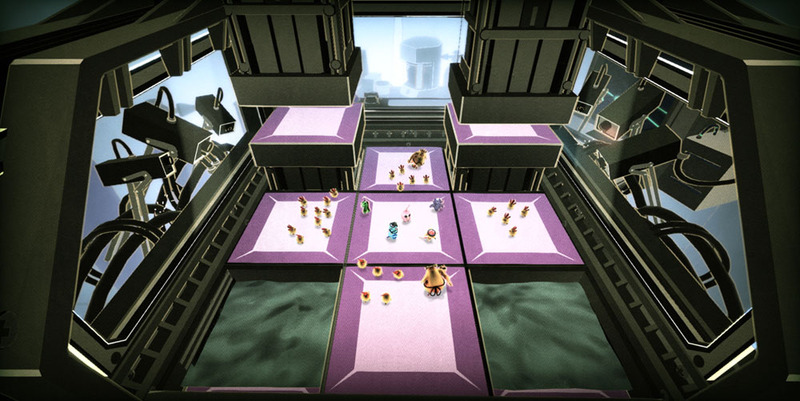 In Tiny Soccer, players are divided into two teams. Each character gets all four powers and players get a set time to score as many goals as possible against the other team. It’s hilarious chaos as the ball keeps getting swapped around and pushed down one side of the field, only to get pulled or swapped back. We ended up with a dev team vs. a reporter team and we ended up in utter ties three times in a row. Again, I think this mode would be great for a party game. I had a great amount of fun with Tiny Brains across all three modes we saw. It’s estimated that a first runthrough of campaign plus additional modes will be about 5 hours, but I can certainly see how the content is extremely replayable. I loved the artstyle and the mood of the game - it just screamed low-key and fun to me. I can also see how serious games could really get into the leaderboards for the challenges mode as well, so I feel that Tiny Brains really caters to a wide spectrum of gamers. Tiny Brains will support local, online, and mixed co-op with drop-in/drop-out supported. It will launch on November 15th for the PS4 on PSN for $20. PS3 and PC versions are also in the works, but they don’t have an official launch date yet. I was told that Spearhead Games hopes to launch the PS3 and PC versions as close to the PS4 release date as possible. Page created in 0.4724 seconds.